I've posted this image before, but here's a photo of it with the frame included. This painting, Miss April, will be exhibited as part of Calendar Girls, opening this Friday night at the Rayner Brothers Gallery in Whanganui, New Zealand. 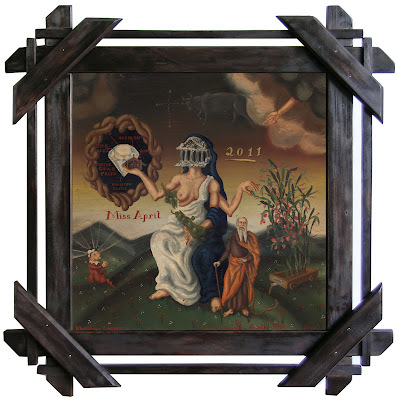 Twelve artists were asked to respond and portray a specific month of the year visually. For April, I used the symbols of April - the diamond, the sweetpea and then added the star sign, Taurus and Numa, carrying the sweetpea in a cart (he was the Roman Emperor who added January and February to the calendar, moving April to the forth month). Miss April is based on the androgynous figure that has the protection of a pater, yet the nurturing of a mater.